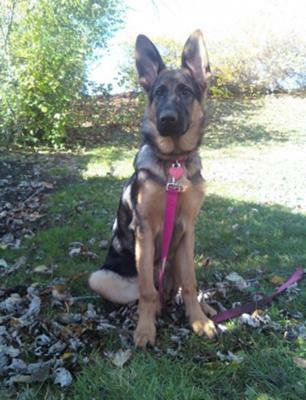 My husband and I have added a GSD to our family in September '09. She is about 5 1/2 months old now and just lost her last baby tooth. I figured her teething would subside after losing all her baby teeth but she has gotten worse with the play biting and gnawing. 2. Saying a firm "no!" 3. Putting her paw in her mouth when she begins to play bite on me. 4. Distracting her with a chew toy. All of these seem to work for the moment that I am correcting her. However, as soon as I finish the correction she is right back to finding a new body part to chew on. She has never drawn blood but I dont want to get to that point. Is she testing my dominance level right now? If so, what else can I do to show "who's boss"? Comments for 5-6 month old German Shepherd "Trouble Maker" Biting EVERYTHING...HELP! I have a german shepherd the same age. She used to nip a lot, but we now have it under control. I never play with our german shepherd. What I mean is that I never play wrestle with her to where she would have the opportunity to think that nipping is ok. Instead I take her on jogs/walks. We have a tug of war toy and a ball. If she wants to play with a person she has to get her toy. I keep all of her toys in a basket that is always accessible to her. I am not an expert for dog behavior but this is what works for me. I tried the holding her on the ground thing, but realized that a german shepherd has a defense drive and it is never a good idea to do. This is why I switched my game plan to what I just mentioned. Mouthing is how dogs, and especially puppies, play. It is normal. Your job is to teach your pup that it is not ok with humans, though I think it's totally unfair to try to teach something with a nasty punishment like sticking your fingers down a pup's throat. Puppy nipping/mouthing is also the initial form of the dog's prey drive -- what makes them chase balls and the key to play training later. 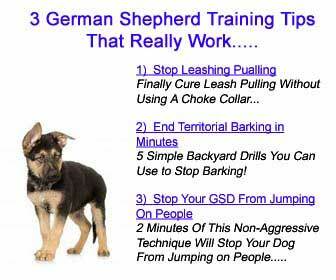 If you damage it with severe punishment early on, you'll lose the most powerful training tool with adult shepherds. Never mind you're punishing an absolutely natural and critical drive in this breed of dog. However that doesn't mean you should let your pup regard humans as puppy playmates or chew toys. Your job should be to teach (not browbeat or intimidate) the pup what is ok to mouth (his toys) and that humans are absolutely off limits. When he mouths you softly, do everything you can to redirect him to a chew or tug toy and play with him while the toy is in his mouth. While playing, if his teeth ever make contact with your skin (or any time he mouths you hard enough to hurt), calmly say Ouch or Nope or something like that, and immediately turn your back on him or leave the room for a minute before paying any attention to him again. Very quickly, your bright pup will understand that mouthing humans ends all the fun and will cut it out. Remember you are teaching a normal pup exhibiting normal behavior, not punishing a mini-Cujo. There is no place for punishment here -- the tools you need are more education and patience. Do what you can to protect your pup's prey drive, because what's an annoying puppy nippyness now will grow into the best possible tool for training, exercising and bonding with your adult shepherd. Google "prey drive" and "play training" for more info. Also check Leerburg.com for more info on managing puppy mouthing. Good luck. Several weeks ago we went through a terrible stage of nipping and nawing on our hands. I was about to give up and began to wonder what kind of puppy we had purchased. I spoke to several other dog owners (different breeds) asking for their advice. Nothing worked until a breeder suggested that I put my thumb down the dog's throat when it tried to bite my hands. It only took a few times and it worked. Basically the biting has stopped and when he wants to nibble on my hand, I tell him "no bite" and he stops. If this doesn't work, it was suggested you put your whole hand, but it never got to that point with me. Good luck! Plus, if you can do more exercise with your GSD that would be REALLY helpful too because dogs that are not exercised often enough can often find entertainment for themselves that we don't approve of - like biting, digging, etc. Tired puppies are happy puppies. Get the whole family involved if you don't have enough time yourself and wear that puppy out and that will help. Plus, the best tip of all, get that dog into a puppy obedience class and it'll be the best money you ever spent. Talk to the trainer and practice the exercises and your dog and you too will both be so much happier in the future.